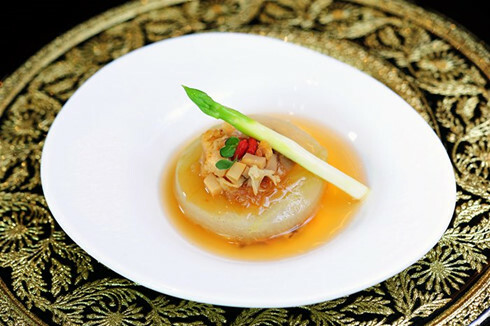 Diners have a chance to savor a wild mushroom soup with cordyceps flowers or a matsutake mushroom soup with bamboo mushrooms in a coconut and other main course choices of braised eight treasure vegetables in tea sauce; steamed sliced bean curd braised with wild mushrooms and vegetables, or deep-fried taro with wild mushrooms. Dishes for the a la carte menu start from VND198,000++ per serving. The Royal Pavilion is located on level 4 of Times Square Building at 22-36 Nguyen Hue Boulevard & 57-69F Dong Khoi Street, District 1, HCM City. The restaurant is open for lunch from 11 a.m. to 2 p.m. from Monday to Friday and from 10 a.m. to 2 p.m. on Saturday, Sunday & holidays. Dinner is available daily from 6 p.m. to 10 p.m.